In a now dry limestone valley, the river long since having worked its way underground in this part. Could be mistaken for Monk's-hood at first glance. The bright mauve flowers in a spike up the stem. The stem is variably round, sometimes angled or even square (as here at the top) and can even have slight flutes. flowers in small bunches and when open they usually all face much the same way. Small bunches of un-opened flower buds. Growing amidst Crosswort and an umbellifer (probably Cow Parsley ). Flower buds are tightly rolled up. Stem has many very short hairs and a smattering of longer ones, espacially on the rear of the sepal teeth. A bell-shaped flower with five petals and nominally five prominent white stamens with a large blob of bright yellow pollen at the ends. Un-opened flower buds taper to a point at the ends. The central inner of the flower is splotched and streaked white amidst a greenish tinge. 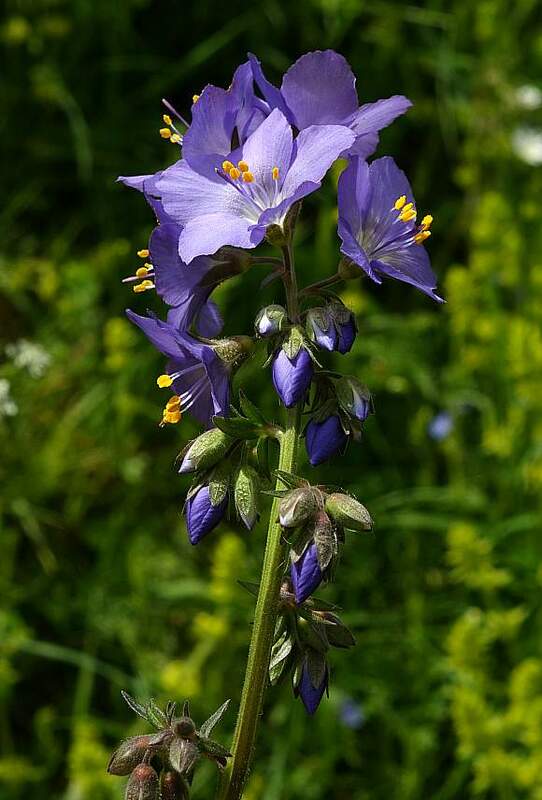 The flowers sometimes give the impression of being slightly zygomorphic and not actinomorphic, especially the way that the stamens seem to be weighed down slightly by gravity, with the lighter style even more drooping. 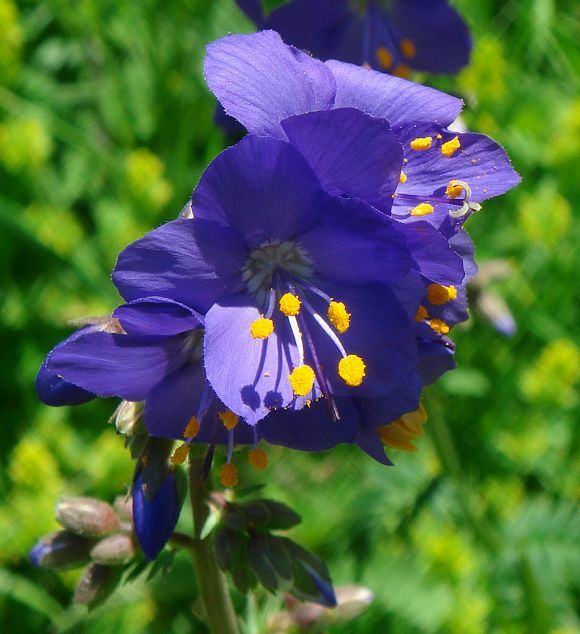 Jacobs Ladder flowers are Protandrous, shedding pollen before the stigma is receptive. This is one of several ways in which certain plants can prevent against self-fertilisation. Not all do. Petals are wide and rounded at the ends. These two are also showing a slight zygomorphic stance what with their drooping then curving-upwards stance of the stamens. Five long pale-lilac filaments with deep yellow anthers atop. 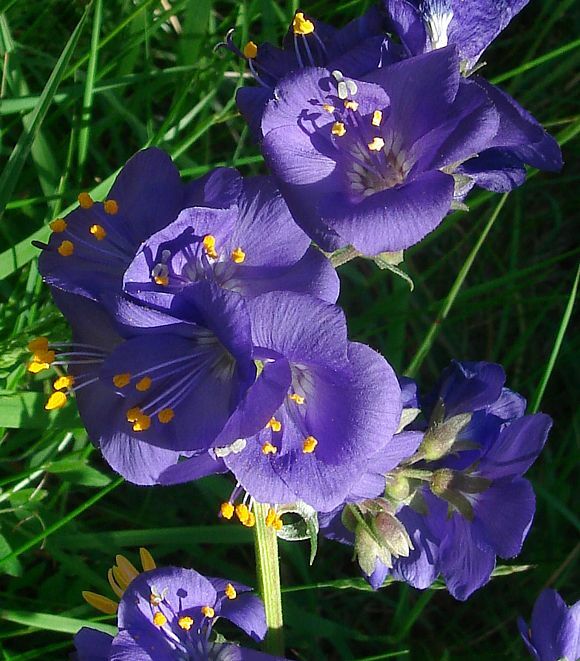 A single longer style with a purple club-shaped stigma at the end. 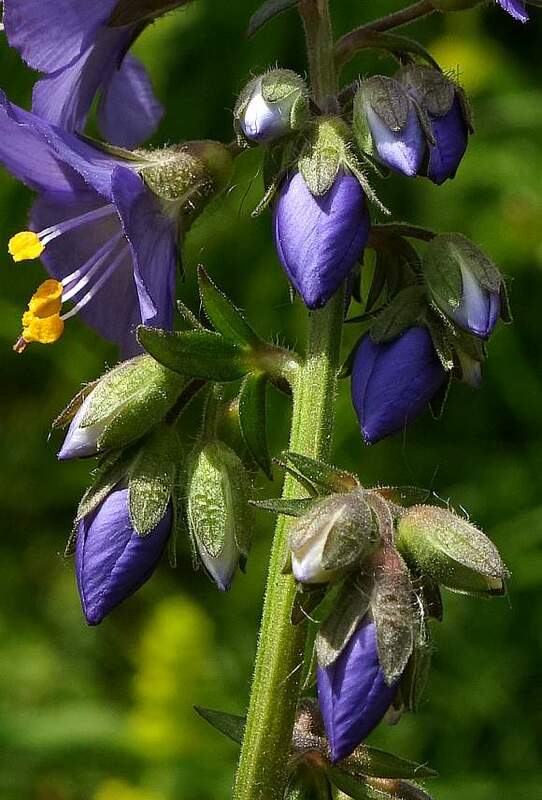 Flowers flared outwards like tubas and all facing the same way leaving good views of the sepals at the rear. The sepal cup with 5 very long and recurved beetroot-brown sepal teeth covered in short hairs and a few longer ones. The forest of lower leaves. 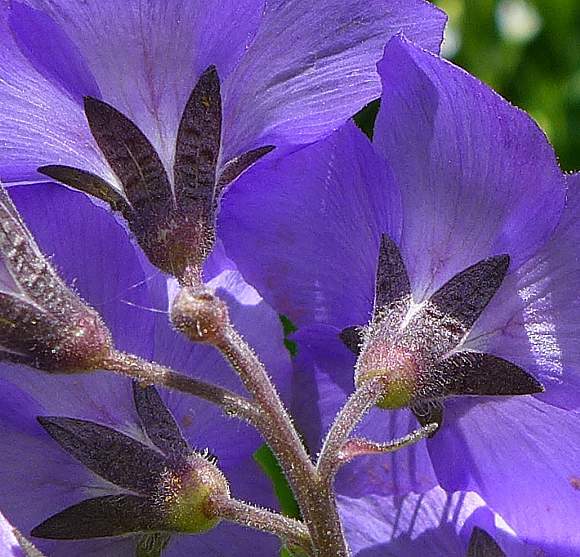 The pinnate slightly hairy leaves are set in pairs at an offset-angle up the ridged stem which maximises the sun-gathering whilst minimising self-shadowing. 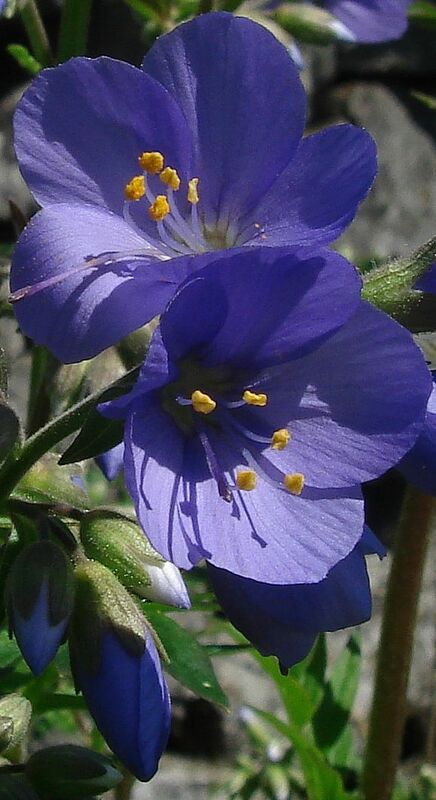 The ladder morphology of the leaves indubitably gave rise to the name 'Jacobs' Ladder' and gives the impression that the leaves may, in a wind, exhibit aerodynamic lift. 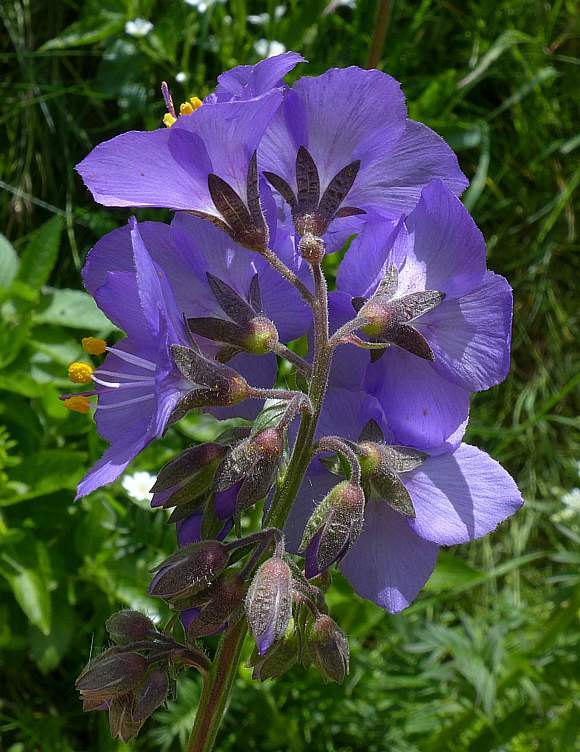 Some similarities to : Giant Bellflower and other tall bellflowers, but the leaves of Jacob's-Ladder are pinnate. No relation to : Abraham-Isaac-Jacob (Trachystemon orientalis) a flower with similar name belonging to a differing family. 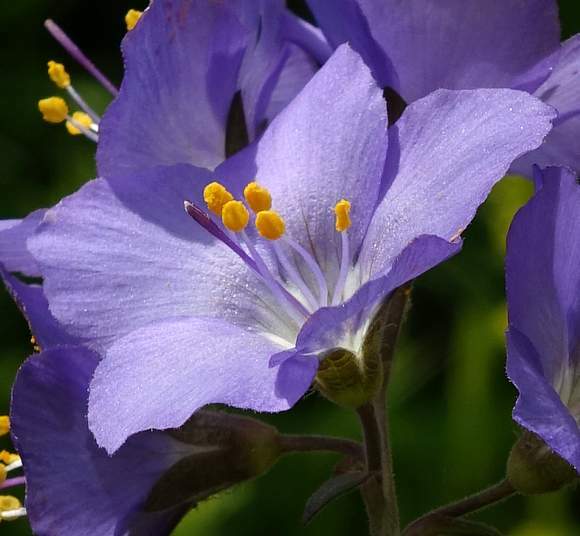 Distinguishing Feature : A medium tall plant to 1m with large bluish bellflower-shaped flowers. 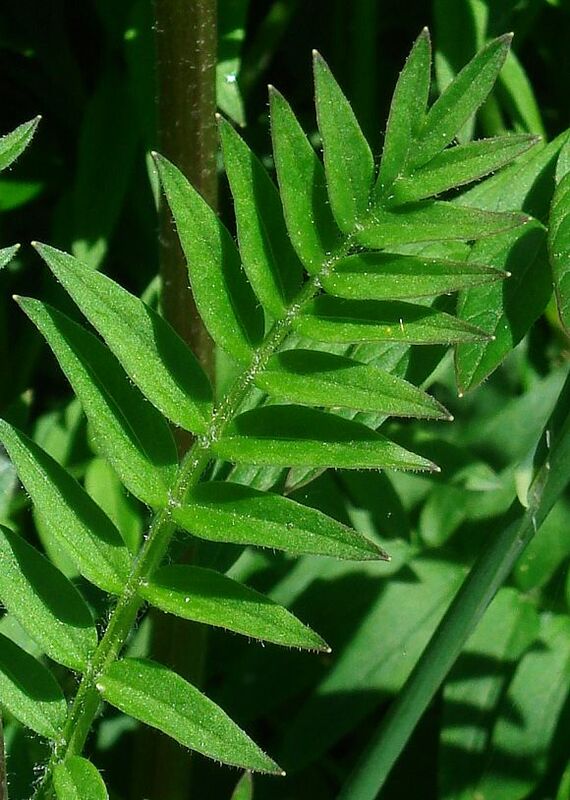 Leaves in a step-ladder conformation, not dissimilar in configuration to those of Solomon's Seal. 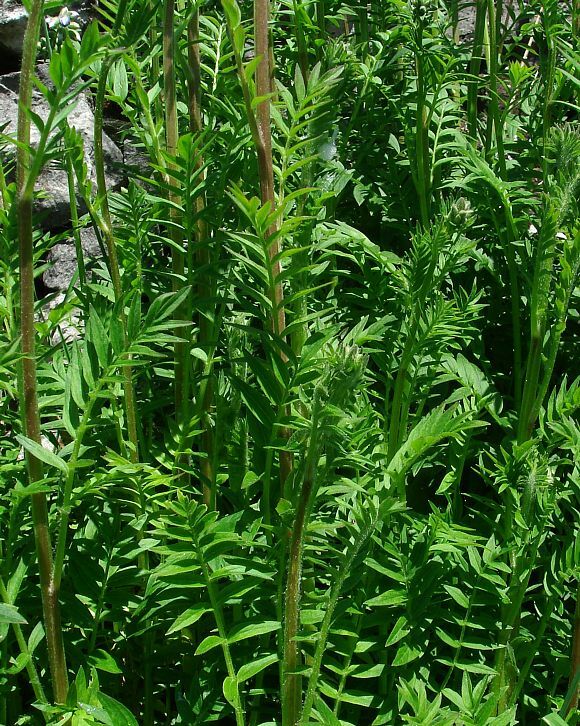 Leaves slightly similar to those of Common Valerian, but with many more leaflets to each pinnate leaf (plus the fact that they are not in opposite pairs at large intervals up the stem, but rather are alternate up the stem). 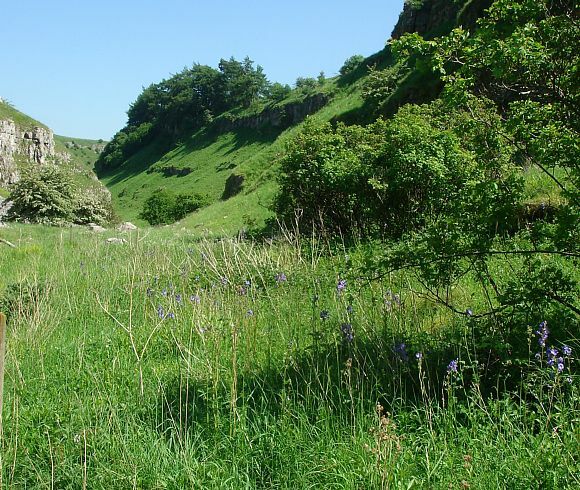 A rare plant occupying several places on limestone cliff ledges, notably at Malham Cove in Yorkshire and localised places in Derbyshire, like Lathkildale. 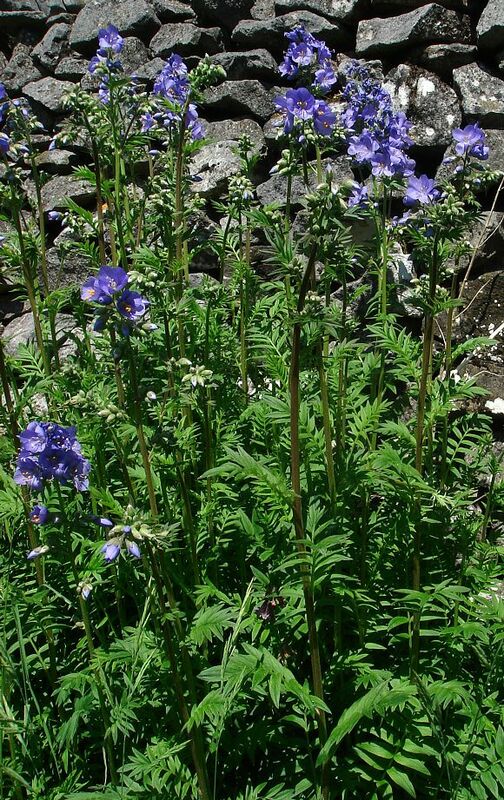 Jacobs Ladder was the only known member of the Jacob's-Ladder Family until taxonomists decided to put a few more Genera in the Polemoniaceae family. It now includes Phlox. A black dye is produced by boiling the plant in olive oil, used as a hair-dressing for men with greying hair. 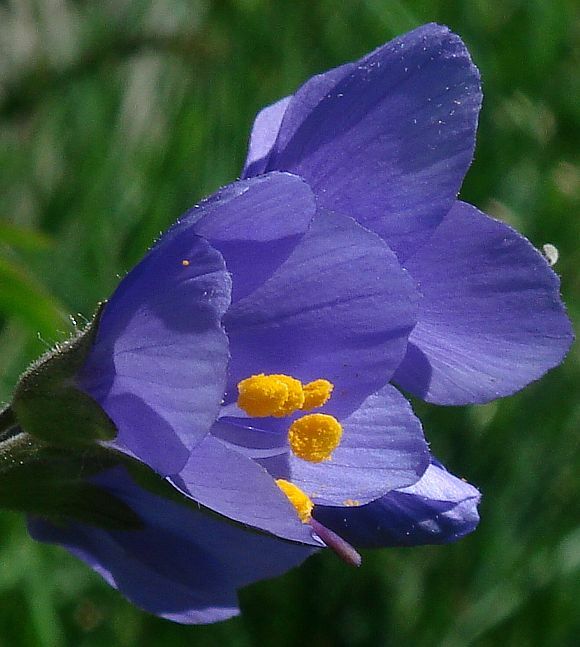 A Protandrous flower is one in which the stamens shed pollen before the stigma is receptive. 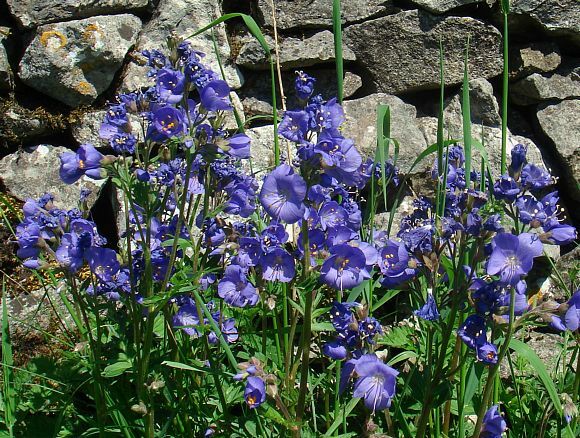 Examples being the flowers Jacobs Ladder and Foxglove. A protandrous flower is first functionally male and afterwards functionally female, but not both at the same time. 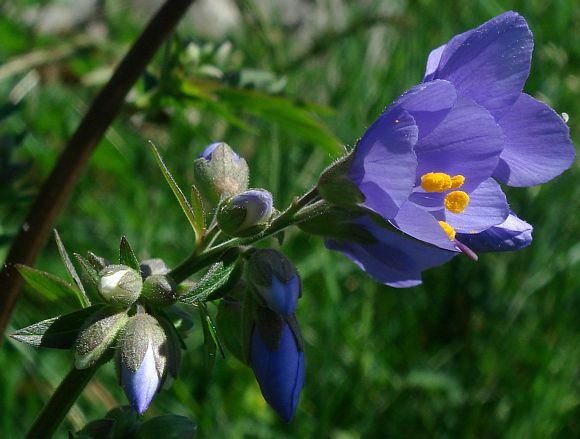 This is only one of the ways in which some plants try to protect themselves from self-fertilisation.